Nigeria midfielder Ogenyi Onazi has called on divine intervention ahead of Super Eagles' international friendly game against Luxembourg. The Eagles will face Luxembourg in the second of their international friendly games on Tuesday. On Friday, the Eagles pipped Mali 1-0, following Kelechi Iheanacho's 77th minute strike after coming on as a second half substitute. 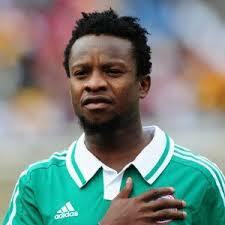 Commenting ahead of the game, Onazi wrote on his Twitter handle: "Game day, let your glory fall, amen. Luxembourg vs Nigeria." The friendly games against Mali and Luxembourg are part of preparations for the Eagles, ahead of the 2018 FIFA World Cup qualifier coming up later in the year.